Jay Townsend wanted Panzer Grenadier to return to the Pacific Theater. So he designed a game that did that: Saipan 1944. But that wasn’t enough island, jungle and canefield fighting for Jay, so he designed an expansion for Saipan 1944 that we’re calling Marianas 1944. It takes the fighting to Tinian and Guam, turning Saipan into a much larger game – and best of all, you don’t need pieces or maps from any other game to enjoy every scenario in Marianas 1944. Here’s a look at the book’s first ten scenarios (the Tinian Tales). You can read Part Two here and Part Three here. The obvious landing beaches for the invasion of Tinian fronted Sunharon Harbor right at the foot of Tinian Town. The Japanese knew this, and prepared to defend the area accordingly. Major General Harry Schmidt, the commander of V Amphibious Corps, made every effort to make the Japanese believe the landing would hit the harbor area, employing a large decoy force and regularly bombarding that locale. While participating in this ruse, the battleship Colorado and destroyer Norman Scott received hits from a hidden Japanese 150mm gun inflicting 62 killed and 245 wounded sailors on the two ships and putting them out of action. However, the true landing areas for the U.S. Marines landing lay in the northwest corner of the island on two very narrow beachheads called White Beach 1 and 2. Neither was heavily defended, thus encouraging the assault. By the end of the day, 15,614 Marines defended a beachhead nearly a mile deep, as support vehicles and supplies began to land. The toll they paid for that real estate totaled a modest 15 men killed, 225 wounded, and three LVTs lost, plus damage to the Colorado, Norman Scott, and several other small vessels. This compared quite favorably to Saipan, but the men ashore braced for the expected night-time Japanese counter-attacks. The Japanese sacrificed 438 of their 9,000-man force in the initial defense. It’s a landing scenario on the new Tinian map, which adds offshore reefs to the problems the Marines will have to overcome. The Japanese are fantastically out-numbered and out-gunned, and will need every edge they can get. Despite the numbers, an opposed amphibious landing is never a sure thing for the invaders. From experience on Saipan the Marines knew the Japanese normally counter-attacked at night to minimize American advantages in airpower and artillery and to maximize the shock of their attack. General Clifton B. Cates, commander of the 4th Marine Division, ordered the regiments to stop their advance on defensible terrain and prepare their defenses. The Japanese did not disappoint, making their assaults in three areas on this moonless night; the left flank, the center, and the right flank, though the left flank hit first. Approximately 600 screaming Japanese SNLF troops charged the American lines. Of the three counter attacks that night, this one lasted the longest. The Marines responded with a wall of fire. The attack continued throughout the night, see-sawing back and forth, but shortly before 0600 the vigor of the enemy effort broke, perhaps due to the rising of the sun or the arrival of American tanks. This is another tough one for the Japanese, attacking while outnumbered and facing the massive firepower of the 1944-model Marine platoons. The nighttime darkness will help a little, but the Marines can make use of Fourth Edition’s new illumination rules to partially negate that advantage. The bar for Japanese victory is set very low, which is good for them, since they’ll take massive casualties trying to achieve even that. The Japanese attack in the center focused on finding a gap in the American lines to penetrate through and eliminate the American artillery positions and beachheads. In later campaigns, the Japanese only employed these types of frontal assaults as a last resort since fighting from fixed defensive positions caused the Americans many more casualties than banzai charges. The fixed-position defensive tactics characterized later bloody campaigns on Peleliu, Iwo Jima, and Okinawa. The attack hit in two prongs. The Marines stopped the first one cold, quickly killing 91 Japanese in a brief but violent skirmish. But the second attack column proved a bit more difficult to overcome, forcing some of the howitzer crews to man machine guns or grab their rifles. But in the end the Japanese attack faltered around 0445, and the survivors filtered back into the darkness. This time the Japanese have an achievable goal and enough force to make it happen. They need to get past the Marine front line by assault or infiltration, and eliminate the Marine heavy weaponry. Breaking through the Marines won’t be easy, but they have the numbers to work their way around them if they hurry – it’s a fairly short scenario. On the Marines' right flank, the listening posts stationed along the road a short distance forward of the main lines reported the rumbling of enemy tanks in the early morning darkness. The Japanese committed the bulk of their tank assets on the island to this assault, with their infantry riding on the tanks or following closely behind. The Devil Dogs readied themselves for the assault. The American naval support illuminated the night for the Marines, taking away the Japanese attackers’ sole advantage. In the morning, 267 enemy soldiers lay dead throughout the U.S. position, along with five knocked-out tanks. While nerve-wracking for the Americans, banzai attacks wasted Japanese soldiers and proved less costly to the Americans than mopping up exercises against well-dug in foes. The three counterattacks cost the Emperor a total of 1,241 men, one-seventh of Colonel Ogata's men in one night. A Japanese tank attack! There aren’t many tanks, but the Marines don’t have much to defend themselves (a couple of 37mm batteries and a halftrack-mounted 75mm tank destroyer). On the other hand, their firepower is so high they stand a good chance of destroying these crapulent tanks via assault. Japanese goals are simple: break through to the beach, and wipe out as many Marines as possible in so doing. The Americans win by stopping them. After repulsing the Japanese banzai counterattacks the first night, the whole Marine front shifted back over to offense again. Company L received orders as part of a larger pincer move against Mt. Maga. Once at the mountain they were to continue to the western slope to take out enemy artillery emplacements. Unknown to them, infantry with mortar support also held those positions, leading Lt. Colonel Cambers to send tanks, combat engineers carrying flame-throwers, bazookas, and demolition teams to assist the attack. Once the combination of all the Marine assets kicked in, Japanese resistance quickly became sporadic. Shortly thereafter the Marines destroyed all three weapon emplacements. By this point in the war the Marines displayed a solid mastery of combined arms tactics, and it really paid off in areas where they could employ their armor. The Japanese are going to miss all those guys lost in fruitless bayonet charges. They have good heavy-weapons support and excellent positions, but Marine firepower is going to be hard to withstand. The Marines don’t have that big of an edge in numbers, but they bring a balanced team of infantry, tanks, engineers and flamethrowers backed by strong artillery. Throughout the night of July 26-27, small groups of Japanese prodded and jabbed for weak spots in the American lines all along the front on. Sometimes the Japanese launched their attacks from what the American's considered their "rear." This caused great consternation as it meant either they had bypassed sizable enemy forces, or they had left gaps in the lines that needed to be closed. Whichever the case, the American casualties began to climb. In the morning, Captain Warren Morris reported 137 dead Japanese sprawled behind, in front of, and among the battalion’s lines. It appeared that the Marines bypassed this group who were bent upon moving through Marine lines to their units, but only in death would these men rejoin their comrades. During the Pacific campaign the Marines learned that night took away "secure" rear areas. Like the title says, it’s a series of small night actions, on just one board with limited forces. The victory conditions are pretty hard on the Americans, who have to keep control of the road without letting the Japanese pick off many of their units. That awesome Marine firepower will surely help as will illumination rounds, while the Emperor’s men trust to the cover of night. The Japanese placed most of their defensive positions around Tinian Town facing outward against the anticipated amphibious attack that never came. Most of these prepared positions did not support a defense aimed in other directions. Regardless, by the time the American ground forces approached the town, U.S. ships, aircraft and artillery had destroyed nearly all of the Japanese coastal defensive weapons already. But among the hills along the coastal road the Japanese continued to harry the Marine advance with heavy machine guns, riflemen, and a few heavy weapons firing from caves and other cover along the route. The Marines employed effective combined arms tactics. Medium tanks and armored amphibians blasted away at positions to suppress the enemy while light flame-throwing tanks moved close enough to pour blazing death into the heavier redoubts. Meanwhile, combat engineers with flamethrowers, demolitions, and bazookas assaulted the fixed positions, and the Marine riflemen and machine gunners covered the surrounding areas. It’s a tough place, Tinian Town. More Japanese infantry, machine guns, anti-aircraft guns and howitzers than a high-class broad’s skinny old gin-swilling granny can hide under her hoop skirt. It takes a special kind of two-fisted Marine to get by in a town like that, a Marine who’s seen more action than a state fair peep show booth, a Marine who drinks his liquor sideways and by the quart. The kind of Marine who reads his Daily Content and cries for more. That kind of Marine. That kind of town. Tinian Town. While the Marines were moving along the north-south coastal road, they encountered mines, so the engineers were brought in. But they soon experienced machine gun fire, and the hills to the one side of the road erupted with large-caliber weapon fire whose origin couldn’t be located. Six rounds in rapid succession slammed into the flanks of the tanks. While Marines pulled the crew from one disabled tank, several Japanese occupied another of the Shermans and began using its machine guns on the startled Americans. The tank couldn’t move but it had become a casemate of sorts. The other U.S. tanks blew apart the enemy-occupied Sherman tank, while riflemen located and destroyed the hidden 47mm gun. But thereafter they abandoned further attempts to reduce the enemy positions until the next day. The Sherman tank crews probably felt distinctly odd shooting at one of their own tanks. The Japanese get to use a captured Sherman tank. In their own Japanese burnt-gold-with-cherry-blossom color scheme. What else do you really need to know? The cliffs of Marpo Point still held a large Japanese force and 2nd Marine Division received the order to eliminate them. That night, under the eerie light of flares, the Marines' battle cry equaled the screams of the banzai charge of the Japanese. The Marines had already survived a series of banzai charges that night, so what was one more? Throughout the night the Japanese again wasted their manpower charging the Marine lines in a number of places, but in the end, they achieved nothing but massive Japanese body counts. Now only the coastal caves and cliffs hid what remained of the Japanese military on Tinian. On August 1st the V Amphibious Corps declared Tinian secure, although extended mopping up went on almost for the remainder of the war – the last Japanese defender of Tinian surrendered in 1953. The Japanese don’t care about holding the island any more – now they’re just out to inflict casualties. Japanese losses are meaningless in terms of victory. They need to catch a long Marine platoon or two on its own and introduce them to the afterlife. The Japanese didn’t care that some American general had declared the island "secure," and that the Marines now considered their operations "mopping up." They hit the Marine command post that night with only death and honor on their minds. This attack proved to be the last organized attempt by the Japanese on Tinian to attack American units. The Marines' Lt. Colonel Easley rallied his surprised and initially disordered men. Then, with the help of some late reinforcements, they defeated and drove off the remainder of the enemy. When the smoke cleared, 119 Japanese lay dead around the 3rd Battalion’s command post, but the Marines had also suffered dozens of casualties, including Lt Colonel Easley. A number of the Japanese soldiers possessed the newer sub-machine that their paratroopers had been using in other engagements. After this fight, the Marines really did mop up, sealing caves and talking civilians and enemy personnel into surrendering. Like all the secured islands, many more casualties accrued during the mopping up duties. Tinian cost the Americans 326 killed in action and 1593 wounded; small numbers compared with Saipan but still losses to families and friends. A Japanese sneak attack! The Japanese make one final, crazed nighttime attempt to die gloriously while taking some Marines with them. And that’s the first third of the scenarios from Marianas 1944. 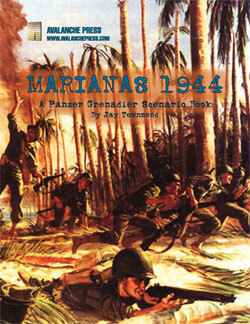 Click here to order Marianas 1944!